Sometimes you’ll get advice about tactics, without the “how to” on actually putting it into practice. Sometimes you’ll get the “how to” on one specific thing, without tying it together with your strategy as a whole. Sometimes you’ll get a little of both, but without the proper training on carrying it forward long-term. 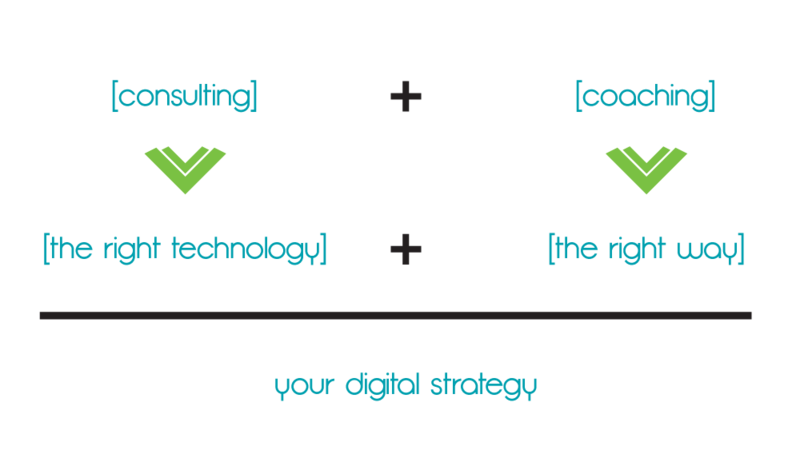 Through a combination of consulting + coaching, I take a bit of a different approach to your digital solution. Because it’s so much more than just a website, it’s about tying together the right technology AND using it the right way for your brand and your dream. Just shoot me your name and email below. Not sure yet? Keep reading. Consulting is my advice, the strategy and recommendations on how to use the right technology for your brand. Coaching is teaching and empowering you to propel your vision for the long-term by using that technology the right way. Starting your dream is hard work, and going at it alone makes it even harder. Especially when you’re figuring out what to do and how to tie it all together. I want to help you use the right technology + the right way to not only start, but also run your business, organization or passion project — from the ground up, for the long-term. We’ll start with your identity. We’ll figure out who you are, who you are helping, and why you are helping them. Then, we’ll represent that in a way that visually portrays your personality and everything you stand for through your logo. Next, we’ll brain dump every idea, every question, and get it all out there. Then we’ll plan. We’ll strategize. We’ll prioritize. After that, we implement. We’ll coach. We’ll train. We’ll stay accountable to progress. When all is said and done, you’ll have a strategy you can be proud of that is setting you up to live out your dream with your business, organization or passion project. There will still be a lot of hard work ahead, but you’ll have the right technology in place, and be equipped to use it. When we focus on input goals, and show up every day, the hard work pays off. So what do you say? Are you ready to take the digital jump into your project? I’m ready if you are! Let’s see if we’re a good fit. Just shoot me your name and email below.